Russell Claude Brock, 1903-1980, later Lord Brock of Wimbledon, was one of the greatest pioneers of cardiac surgery. Working at Guys Hospital London he was one of the three surgeons who in 1948 led the world into the modern era of mitral valve surgery. The other two pioneers were Charles P Bailey and Dwight D Harken in the USA. 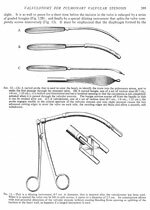 Brocks first operations consisted of finger dilatation of the mitral valve but he then invented a mechanical dilator which gave better separation of the commissures of the valve. The instrument was inserted through a stab wound in the wall of the left ventricle and passed retrogradely through the mitral orifice being guided by a finger in the left atrium. The jaws of the dilator were then opened by pressure on the handles and the valve dilated. The illustration shows our own Brock mitral valve dilator which was generously donated by Sir Terence English. Tetralogy. Brock decided that a direct attack on the pulmonary stenosis would be haemodynamically better than this palliative operation. Accordingly he invented a pulmonary valvulotome and in 1948 published three successful results with his instrument. The illustration shows the instrument in our museum, also donated by Sir Terence English. It was inserted via the right ventricle through the stenosed pulmonary valve. Illustration of Brocks pulmonary valvulotome from the article Valvulotomy for pulmonary valvular stenosis written by himself and Dr Maurice Campbell from Guys Hospital. British Heart Journal 1950;12:377-402. Lord Brocks work and interests extended beyond cardiac surgery. He was deeply involved in the Royal College of Surgeons of England of which he became president from 1963 to 1966. He wrote widely including a book on the famous Guys surgeon Sir Astley Cooper, and was editor of the Guys Hospital Report for 25 years. Outside medicine he was an authority on the history of London Bridge and its environs, and he had a special knowledge of antique furniture and prints.